Paco Díaz (Palma de Mallorca, Spain) on 6 March 2009 in Lifestyle & Culture. On 25 October 1917, the refusal of an order for the Aurora to take to sea sparked the October Revolution. 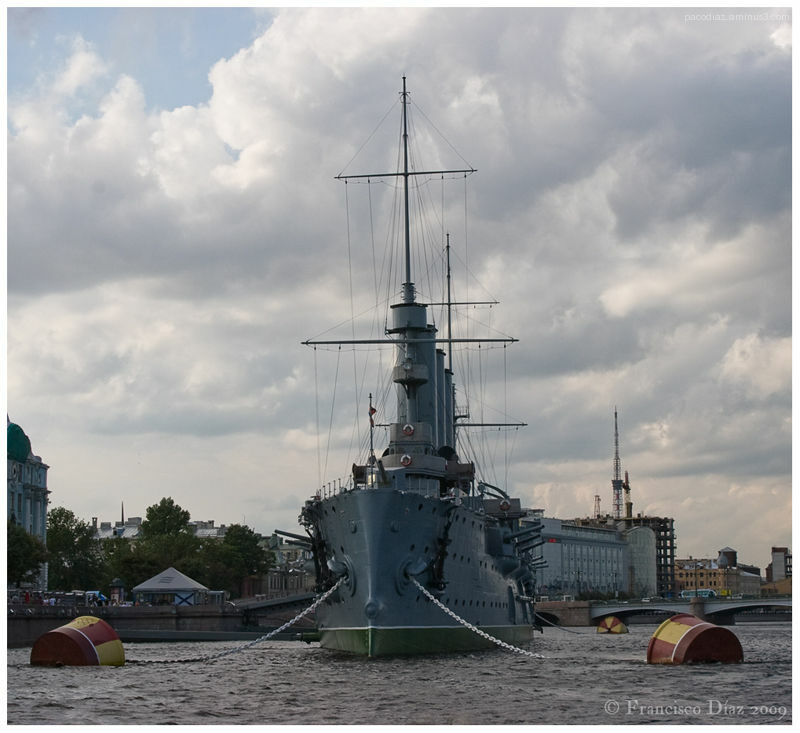 At 9.45 p.m. on that date, a blank shot from her forecastle gun signalled the start of the assault on the Winter Palace, which was to be the last episode of the October Revolution. Aurora's crew actually took part in the attack. la folie humaine dans toute sa splendeur ! Standing tall in all of it's splendor. What a great cloud day for a shot like this. Very nice. Oh! quel équilibre! quel composition! j'aime particulièrement la tonalité de cette image, très élégante! même si le sujet paraît grave! Beautiful! As I see you are in St. Petersburg now. You are traveling a lot! @Sergei Z: Thanks very much, Sergei. I'm now in Mallorca, I went to Russia the summer of 2007 with my 20D. Thanks. You were there in 2007 and I was there in the spring of 1968. Love your composition here! Wow, such a strong subject and beautiful clouds... the angle and composition are just wonderful! Interesting shot, the boat looks so thin I'd be afraid of it tipping over. Thanks for the history, I didn't know that. Paco, es una foto magnifica. Con El Cielo y la composicion de la foto tiene que ser en una revista! Me Gusta mucho! Gracia por la leccion de historia tambien. She still looks ready for action ! Thank you for the information!! What a magnificent ship! !